America is raising its beef consciousness. People in the know are seeking out grass-fed beef, which offers benefits over the now-conventional grain-fed beef. Taste. Those who buy grass-fed beef prefer the flavor. All cattle grazed on grass before the industrialization of the beef industry led to feedlot farms and antiobiotics. See The Meatrix. Health. Grass-fed beef produces a healthier meat: three times higher in heart-healthy omega-3 fatty acids and vitamin E and around 10 times more beta carotene. And that’s just the beginning of its superior nutrition. Clean Eating. Clean eating means trying to steer clear of chemicals and additives, such as the antibiotics and hormones given to conventionally raised cattle. 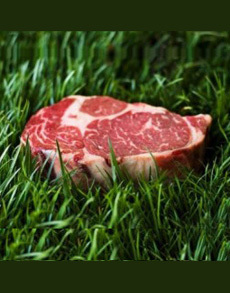 Grass-fed beef is a natural product. Environment. Grass-fed beef is better for the planet: It produces less waste and helps to create a healthier ecosystem. As opposed to feedlots, which pollute water tables, grass-grazing cattle provide natural weed control and help to cycle nutrients in the soil. Plus, the grass they feed on grows naturally, whereas vast amounts of resources are used in raising the grain eaten by conventional cattle. Humanity. Cattle that are grass-fed typically live a more natural and enjoyable life. They eat what nature intended them to eat and have the opportunity to roam stress free, as opposed to the stressed lives of tightly-penned-in cattle. So, the next time you buy or order beef, if there’s a grass-fed option, try it. Let us know what you think. How many different cuts of beef have you had? Check out our Beef Cuts Glossary.